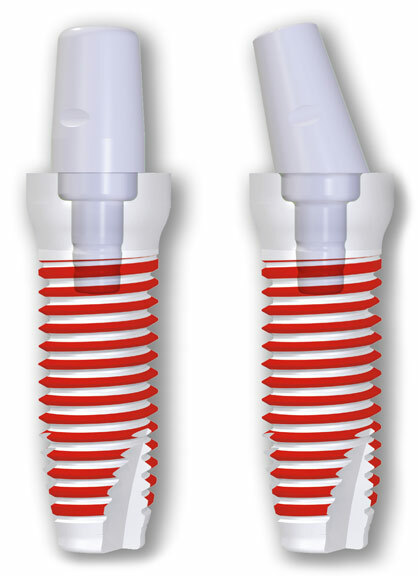 ONE-PIECE: We rarely use this option, but in case it is indicated, it is imperative to comply with wearing a protective device for 4-6 months in order to ensure the success of the implant. 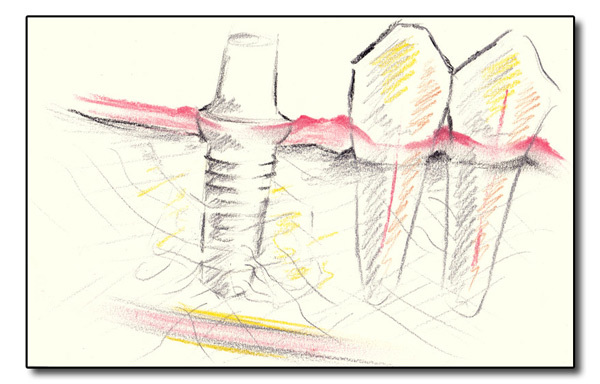 TWO-PIECE (glued or screw-retained): These cases do not require strict protective appliance protection, however we still recommend the patient to wear it some parts of the day for two months only. 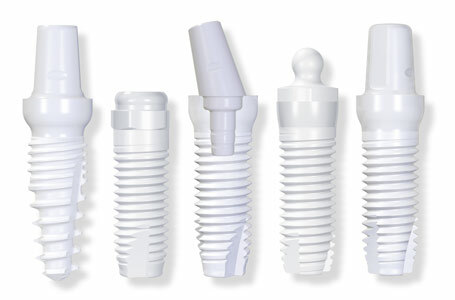 ONE-PIECE IMMEDIATE LOAD: These are mostly used in softer than usual bone, or in aesthetic areas. 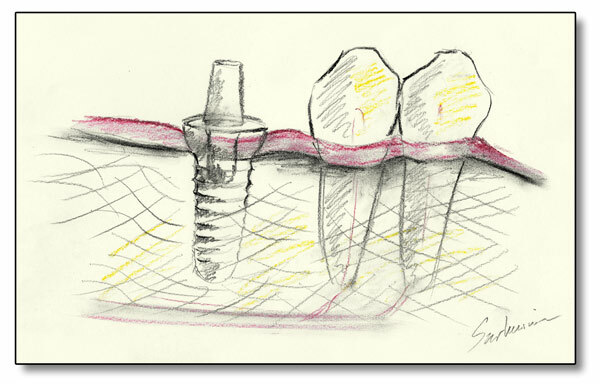 They are one-piece, however can be restored with a temporary crown immediately, provided the patient does NOT chew on it directly. In two months, we restore it with a permanent crown. X-rays should be emailed beforehand. Dr Sarkissian will evaluate those free of charge before calling you in for a consultation. Consultation: To determine whether you are a candidate for Zirconia implants, Dr Sarkissian will evaluate the implant site, the bite, the anatomy of the area, the gums, the jaw-joint, and your general health situation. If it is determined that we should proceed, then an appointment is made for a full dental exam and records, and a prescription is given for further X-rays if needed. Dental records exam: impressions are taken, dental charting is performed, photographs are taken, and forms are completed. Surgical stent: Sometimes a special stent is made over a stone model of your teeth, based on the projected implant and tooth position. The stent is fitted and delivered. A marker in the stent predicts the position and angulation of the implant(s). In most complicated cases the stent is made based on the Galileos CBCT scan (see next section). Cone-beam scan (e.g. iCAT or Galileos): You will have to make an appointment with a radiology lab, where a scan is taken of the jaws while wearing the surgical stent. 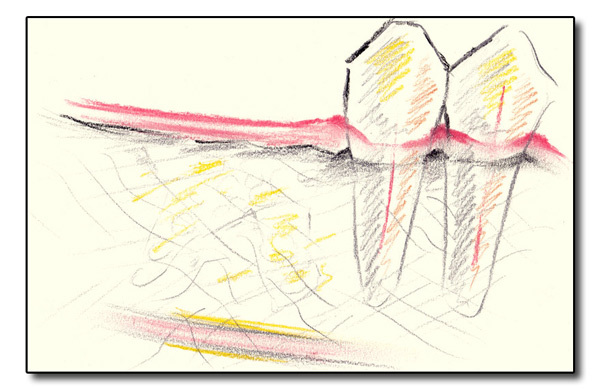 The markers in the stent will appear in precise orientation to the underlying bone. Based on this information, the exact location of the implant will be determined. 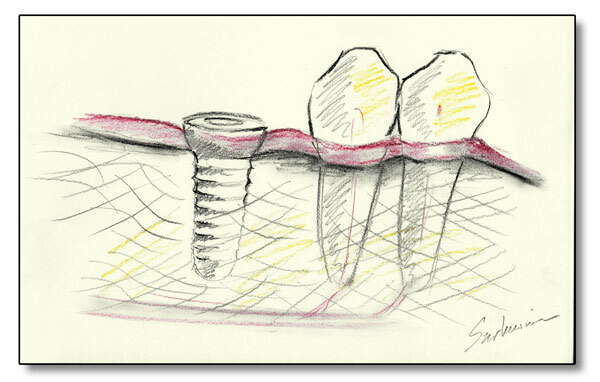 The stent will be used during surgery to guide the point of entry into the jawbone and the exact depth of the implant. 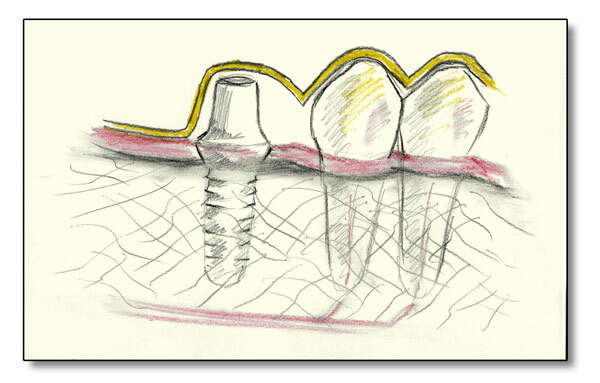 Surgical implant placement: The surgery is carried out under local anesthetic. IV sedation is always an option. Simple cases take less than hour and are generally well tolerated. A few X-rays are taken during the procedure to confirm the position of the implant. Stitches may or may not be required. 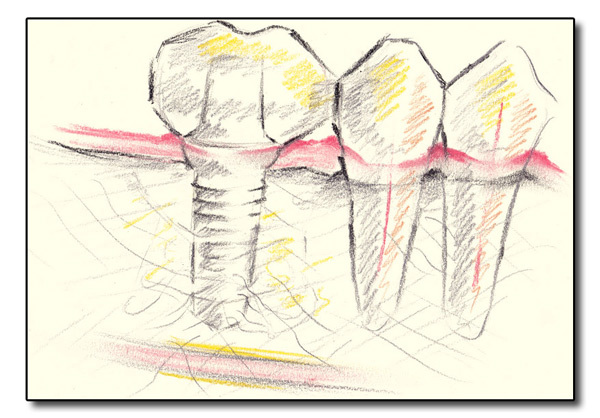 If the Zirconia implant is a one-piece implants, a protective appliance is delivered on the same day. Follow-up appointment : Two weeks later a half-hour appointment is needed to remove stitches, if any were placed, to check healing, and to adjust the protective appliance. 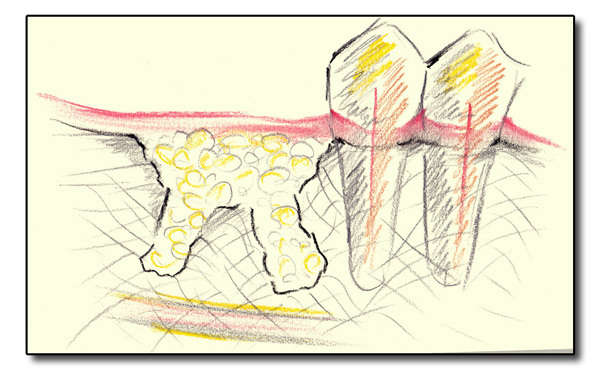 Crown placement: In rare cases where a heavy bite necessitates a full zirconia crown, an impression is taken, and in 2 weeks a lab-fabricated crown will be cemented over the implant and your treatment will be complete. 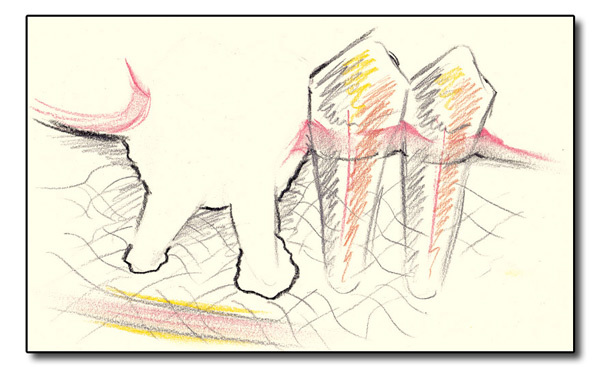 Hi, In late October 2012 I crashed my bicycle and lost one front tooth. it is broken at the gum. i have not had the root removed the two adjacent teeth are a strong. i do not have a regular dentist and need to take care of this and the zirconium sounds like sound logic. i would like have a consultation and see if you feel like my situation is suitable for the procedures outlined above. i will be out out town between 1 July and the 8th. I am looking forward to meeting with you. Hi Jim, we would be glad to see you. 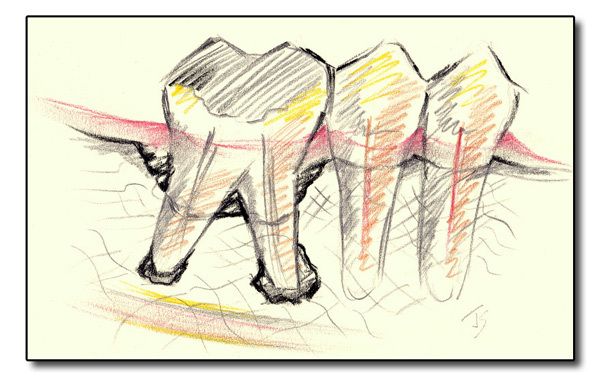 Please email me an Xray of the tooth if you have a recent one, and call Melinda to schedule a consultation.